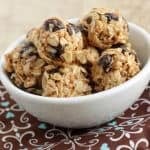 These make-ahead no-bake Cinnamon Raisin Peanut Butter Energy Bites taste just like a cookie! They are perfect for snacks or lunchboxes and are yummy when cold too! If you ask me, peanut butter is best served on a finger. At least it is when I need a quick bite of something to stave off hunger and satisfy my sweet tooth. But I’m pretty sure that’s not how the peanut butter makers meant for it to be served. But if you’ve been around my blog for awhile, you’ll know that it’s no secret that I love peanut butter. These Cinnamon Chocolate Peanut Butter Overnight Oats and these Double Peanut Butter Chocolate Covered Cake Balls are two of the most popular recipes on my site! You can find lots more peanut butter recipes when you do a recipe search too (find the results here)! 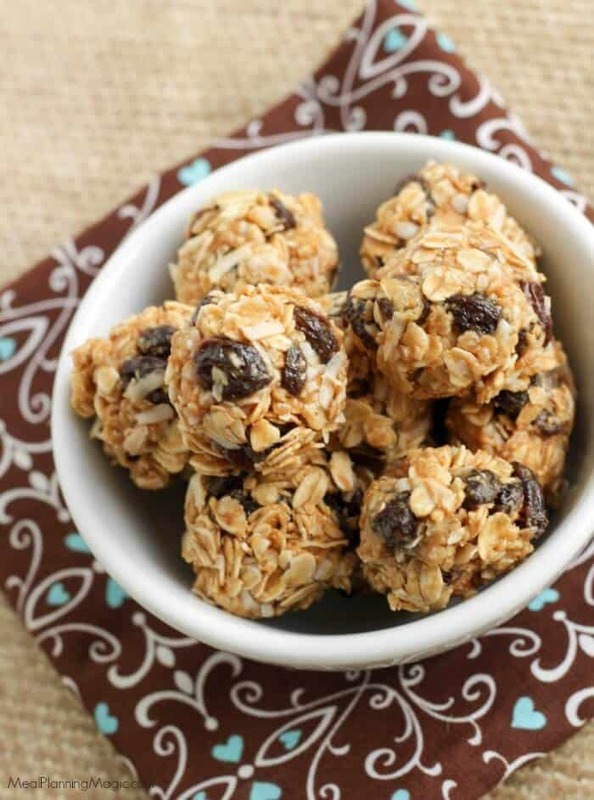 So when I rounded up 65+ Better For You Road Trip Snacks, it reminded me of these Cinnamon Raisin Peanut Butter Energy Bites that I made a few years ago. They’re like a yummy peanut butter oatmeal cookie but without all the guilt! 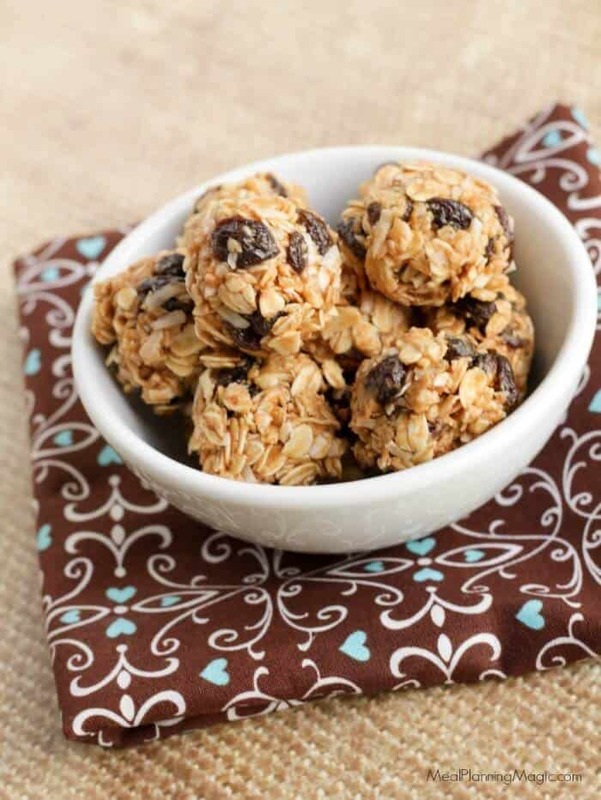 They’re like a little granola bar bite in a bite-sized ball and are relatively healthy for you with the only sugar coming from a bit of honey and the raisins. Yum! I love that little bites like this with peanut butter can give some great energy with a punch of protein. These are SO easy and keep well in the fridge or freezer for when you need a quick snack or on-the-go. My son especially loves these when they are cold from the fridge! They are also great in a lunch box. So many different options! I’ve made a few updates to the recipe but they’re still as delicious as ever! I hope you’ll give them a try! 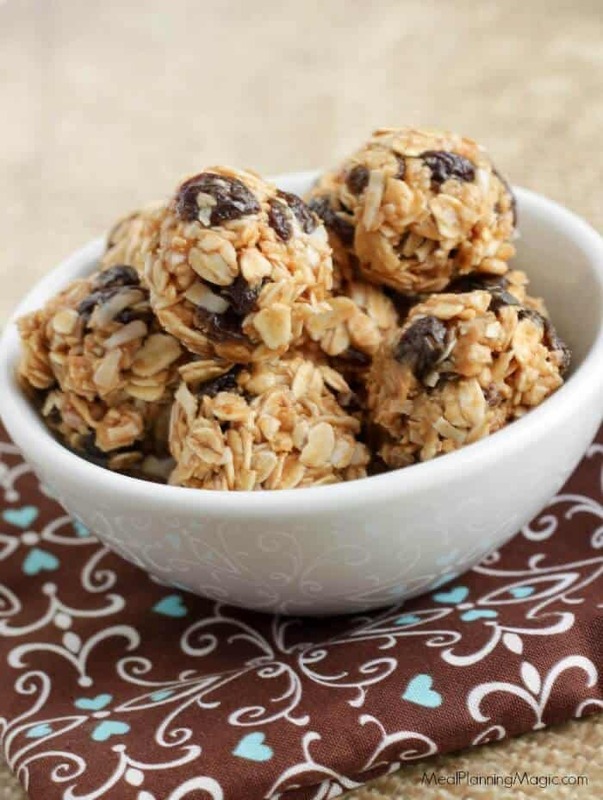 These make-ahead no-bake Cinnamon Raisin Peanut Butter Energy Bites taste just like a cookie! They are perfect for snacks or lunchboxes! In a large bowl, add the peanut butter, honey, vanilla and cinnamon. Blend until smooth. Add remaining ingredients: oats through raisins. Place in the fridge for about 30 minutes. When ready, scoop out about a tablespoon size amount and roll into a ball. For me, it was easier to squeeze the mixture together a bit first, then roll into the ball. If you prefer, coat the palms of your hands with non-stick baking spray so that they mixture is easier to roll without sticking. 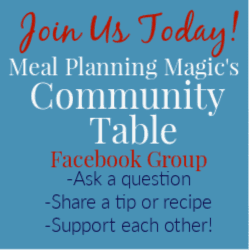 Place balls in an airtight container in the fridge or freezer. Enjoy!